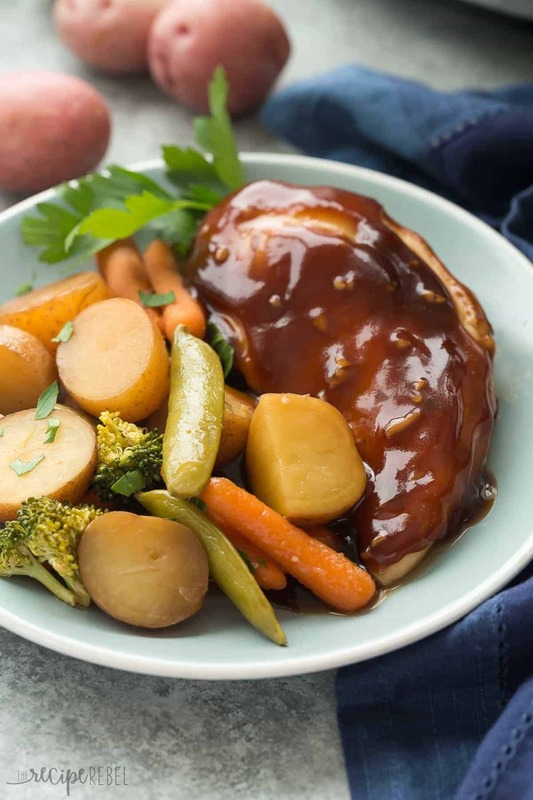 This Slow Cooker Honey Garlic Chicken and Vegetables is a new family favorite! 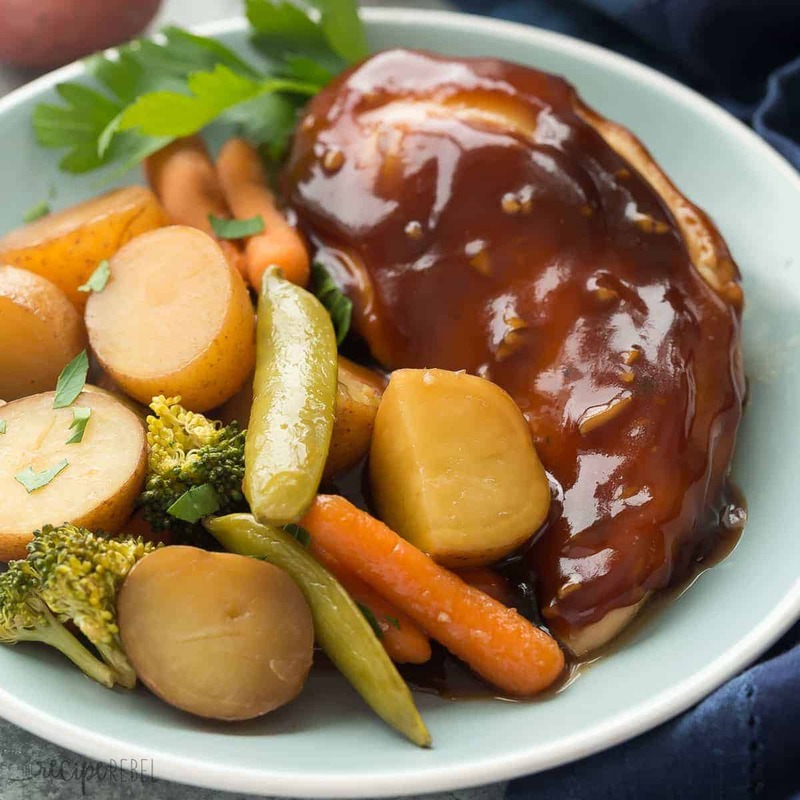 It’s sweet and savory and a complete one pot meal with chicken breasts, potatoes, broccoli and carrots and a homemade honey garlic sauce! Includes how-to recipe video. There is pretty much nothing that makes me happier than adding another completely useful, delicious, easy and healthy meal to my recipe index here on The Recipe Rebel. Even though I’ve been at this for almost 3 years (whaaaaaat?!?! ), there are so many more things I have up my sleeve, so many more recipes I want to share. And so every time I add one more, especially when it is a family favorite like this one, I’m so happy to check it off my list. I know this is no surprise to you, but I love a little sweet with my savory. Honey garlic, teriyaki, sweet and sour, pineapple dishes — these are some of my favorite dinner recipes! It seems like no one has any problem with their dinner when one is on the table (which is a breath of fresh air for this mom of a toddler and a preschooler). But it’s also important to us that we focus on real food and get a good amount of veggies and protein (which is hard only for me, because I’m the picky one in our family!). I opted to use tomato paste instead of ketchup in the sauce so you can control the sugar, and the honey sweetens it naturally. I have BIG love for my slow cooker, but my biggest issue with slow cooker recipes is that sometimes the flavors just seem so dull after cooking for such a long time, and if you’re cooking meat, I find the juices that run out end up diluting the sauce and spices and also mute the other flavors. 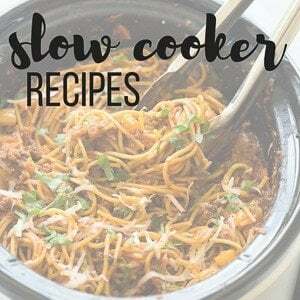 There are two things that I like to do when I’m using my slow cooker to hold in all that flavor you’re putting in: brown any meat before adding it to the slow cooker, and add something to spice it up at the end of the cooking time. Both of these are totally optional, and even doing just one of them can make a big difference in the flavor! 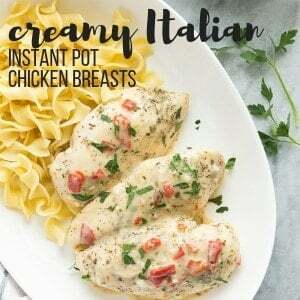 For this recipe, I opted to throw everything in the slow cooker, but save some of the sauce to thicken and drizzle over the chicken after cooking. It makes for super quick prep and only requires a little extra time at the end. You can definitely just skip and serve straight from the crockpot. 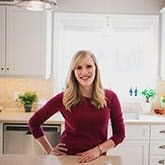 In the responses to my reader survey at the beginning of the year, I had a few requests to include possible substitutions to make some recipes more allergy friendly. Since this isn’t normally a concern of ours (aside from the odd gluten-free dessert I bake to serve to family), I’m not an expert in this area. However, I’m going to try to do a better job of labeling my recipes so they are easier to find for people who have these needs. It’s super simple to throw everything in the slow cooker in the fridge the night before, and then just turn the slow cooker on in the morning. Just keep the extra sauce in a container to thicken before serving and you’re good to go! This post is generously sponsored by The Little Potato Company, and I have received compensation for my time in creating the recipe. As always, my opinions are my own. 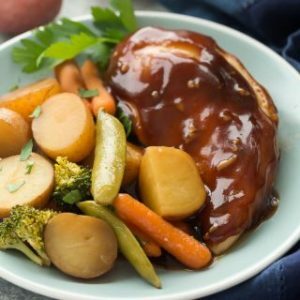 This Slow Cooker Honey Garlic Chicken and Vegetables is a new family favorite! 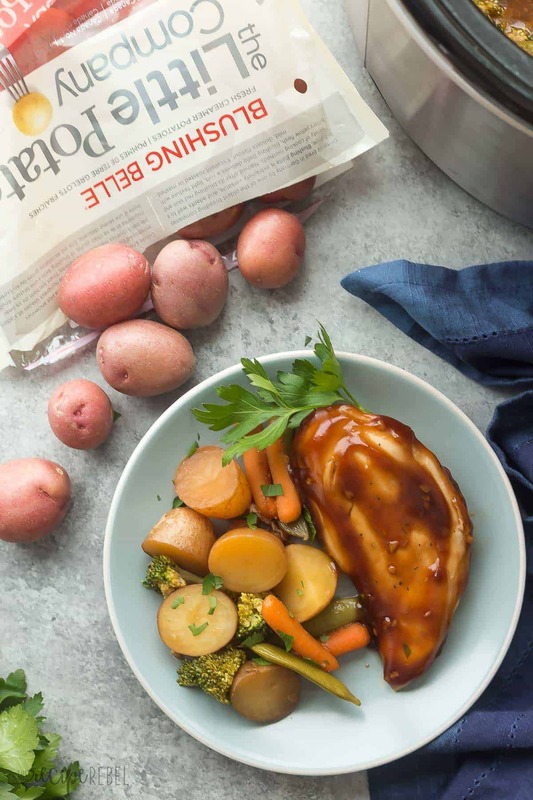 It's sweet and savory and a complete one pot meal with chicken breasts, potatoes, broccoli and carrots and a homemade honey garlic sauce! Includes how-to recipe video. In a medium microwave-safe bowl, toss together potatoes, carrots and canola oil. Microwave on high for 7-9 minutes, until somewhat tender (about half-cooked -- they will continue cooking in the slow cooker). 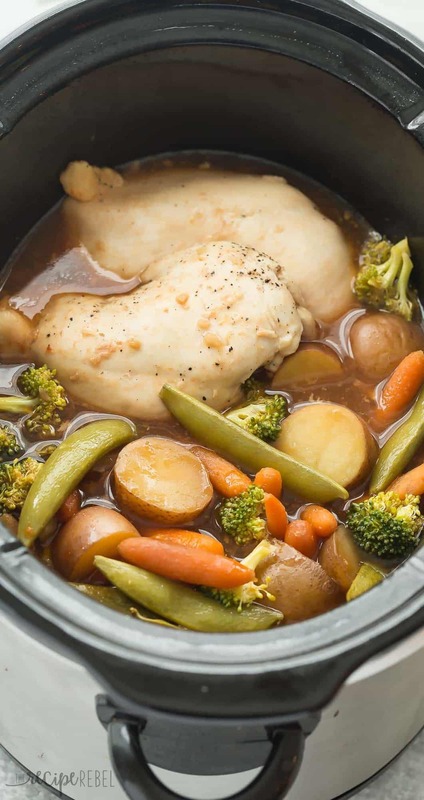 Add chicken breasts to a 4-6qt slow cooker and top with potatoes and carrots. Season with salt and pepper. In a medium bowl, stir together tomato paste, vinegar, honey, garlic, soy sauce, chicken broth and corn starch. Pour half of the mixture over chicken and vegetables in the slow cooker. Keep the other half in the fridge. Cover slow cooker and cook for 3 hours on high (or about 6 hours on low). Add broccoli and snap peas to the slow cooker (don't stir -- they will steam), cover and cook for another 20-30 minutes on high or 45-60 minutes on low until tender-crisp and chicken is cooked through. Meanwhile, pour remaining sauce into a small pot and cook over medium heat, whisking often, until thickened. Serve chicken and vegetables with extra sauce. *Nutrition information is estimated and will depend on exact serving size, types and brands of products used. The information above is ¼ of all of the ingredients -- considering you won't consume all of the juices from the slow cooker, the actual numbers are considerably lower. In a medium microwave-safe bowl, toss together potatoes, carrots and canola oil. Microwave on high for 7-9 minutes, until somewhat tender (about half-cooked — they will continue cooking in the slow cooker). Cover slow cooker and cook for 3 hours on high (or about 6 hours on low). Add broccoli and snap peas to the slow cooker (don’t stir — they will steam), cover and cook for another 20-30 minutes on high or 45-60 minutes on low until tender-crisp and chicken is cooked through. *Nutrition information is estimated and will depend on exact serving size, types and brands of products used. The information above is 1/4 of all of the ingredients — considering you won’t consume all of the juices from the slow cooker, the actual numbers are considerably lower. For the veggies at the end – is it 30-45 mins on low or high? Probably 45-1 hour on low and 20-30 minutes on high. I will update the recipe! SO, i want to make this but im allergic to the soy sauce. is there something i could use instead? This looks so scrumptious, and I love that you saved some of the sauce to make it extra saucy and delicious! I’ve got to try this recipe, Ashley! Thanks Rachel! 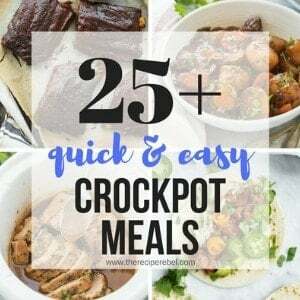 It’s one of my favorite ways to punch up a slow cooker dish! I love sweet and savory, and the sauce looks so flavorful! It is hard to liven up slow cooker dishes, but it looks like you’ve done it here in a big way. This would be a hit! Sweet and savory is the best kind of combo! One of my favorites too, especially in a slow cooker meal! And honey garlic is definitely a winner. What a perfect comfort food meal, Ashley! Looks so good with those veggies!